A large portion of the roof has been destroyed. A spokesman for the fire service, Lieutenant Colonel Pascal Le Testu, said 650 square metres (7,000 sq ft) of the roof had gone, along with a section of a central staircase. Some of the brickwork on the front of the building has collapsed. Renowned fresco ceiling paintings by Charles Le Brun in the Gallery of Hercules were also "severely damaged by smoke and water", Lt Col Testu said. About a dozen neighbours were evacuated, and one firefighter was slightly injured. 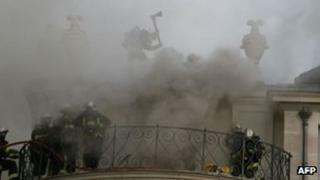 The mayor of Paris, Bertrand Delanoe, said the fire had shocked and saddened him. In a statement, Mr Delanoe said the city authorities would monitor renovation works at the building, which he described as a "significant part of Paris's heritage". Renovation plans by the owner, Prince Abdullah Bin Abdullah al-Thani, brother of the Emir of Qatar, sparked concern from conservationists keen to preserve the historical architecture. "It really is a catastrophe because we fought for the frescos of the Gallery of Hercules to be preserved in the renovation project and now everything has gone up in smoke or been drowned," neighbour Sophie Pons told the AFP news agency. The building was acquired in a state of disrepair.